Fishers High School percussionists will perform at the inaugural Fishers Arts Crawl on Friday, July 10 from 6 to 7:30 pm. 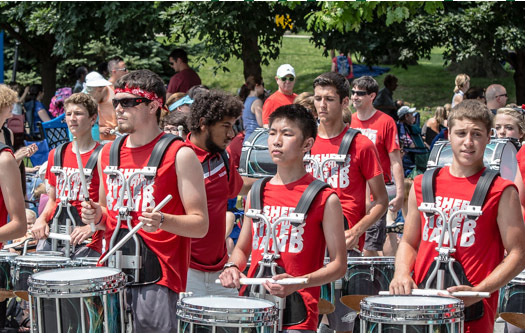 FHS percussion will be playing (simple) beats while walking down 116th Street as a part of the entertainment for Arts Crawl. The FHS percussionists are one of many performers and artists participating in this event, which runs in full from 6-9 p.m. It features local artists, artisans and performers hosted by over 20 businesses throughout the Nickel Plate District, along 116th Street. The evening is capped by an AMP After Dark concert featuring Jennie DeVoe at 9 p.m. Both events are free to attend. Please park and gather at Hampton Inn at 11575 Commercial Dr, directly behind Starbucks/GiGi’s Cupcakes. At 6pm, play street beats starting at Hampton Inn and moving to Blue Peppermint, the little boutique house across the street, behind Wendys. From there, stay on the S side of 116th and travel to the Rotary Arch mini-park at the corner of 116th and Lantern. Then, keep going along S side of 116th to CVS. Take a break there and then travel the route backwards, leaving CVS around 7:30 or so.